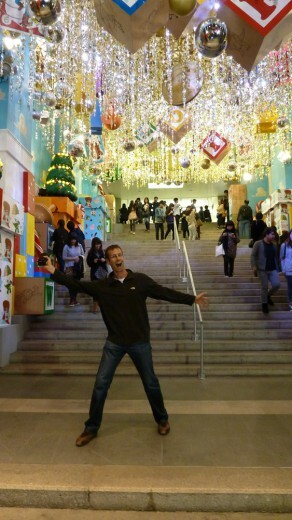 When we decided to fly home from India for Thanksgiving, Pierre insisted that we stop for 24 hours in Hong Kong. He had been there a few times for work, and had been taken with the cosmopolitan feel and the fascinating contrast between the city’s bustling energy and the utter peace that is found on its lush, green peak. I couldn’t wait to see it for myself. We arrived in the late morning after having spent the entire previous day racing through the streets of Delhi on our whirlwind sightseeing tour, followed by a long night on an airplane. In other words, we were completely pooped. Not that we were going to let that stop us! We pounded a few cups of coffee and set out for some dim sum and sightseeing. The dim sum, I have to say, was disappointing. We sampled it at both lunch and dinner and weren’t blown away either time. I’m not sure if we picked the wrong places or were just stifled by my vegetarianism (Hong Kong is an extremely challenging place for the carnophobic), but I’ve had better dim sum in Oakland’s Chinatown. 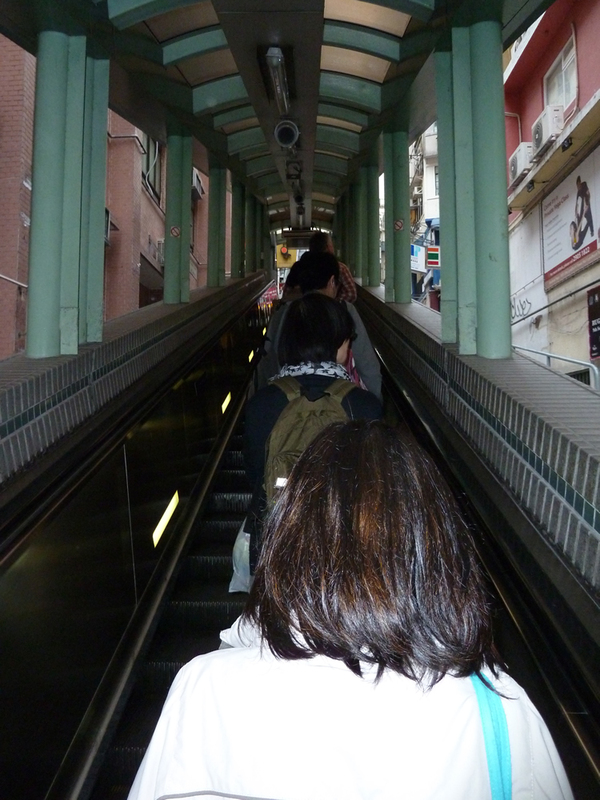 Outdoor escalators in Central Hong Kong. 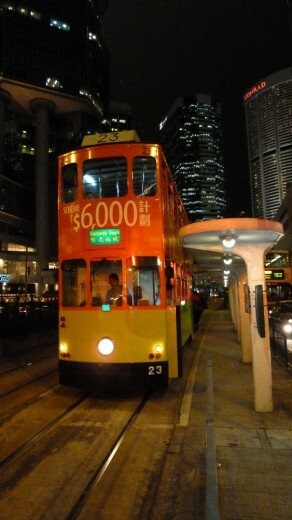 We reached the top, and then meandered back downhill on the other side until we found the Victoria Peak Tram, a relic of the British colonial era. (Before the tram was built, the well-to-do British were carried in chairs up the side of the mountain by the locals.) Now, nearly 100 years after being constructed, the creaky old funicular still chugs its way up what feels like a 90-degree hill. We boarded the tram just as the sun was setting, hoping to watch the lights come on downtown. 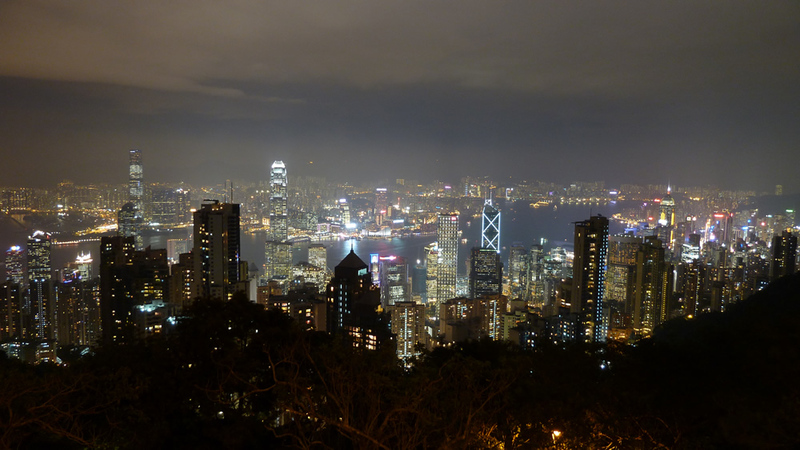 At the top of Victoria Peak, what was once a serene, jungly viewpoint is now a less-serene tourist trap. There is a giant new mall-like structure there with several overpriced restaurants (I swear I spotted a Bubba Gump’s) and shops selling kitschy souvenirs. Pierre and I headed down the road away from the guidebook-wielding masses to gaze out over the city at night. As Pierre had promised, it was something special to be in such a forest-like setting, perched above the bustle of a vibrant major metropolis. Hong Kong's flashy night skyline. The wind was cold and fierce on the Peak, so we stayed only a short time before returning to sea level and catching the Star Ferry across Victoria Harbour to Kowloon for dinner. Along the way, we marveled at the clean streets and the swanky shops, and checked out the double-decker streetcars and some of the flashy light displays on the downtown buildings. 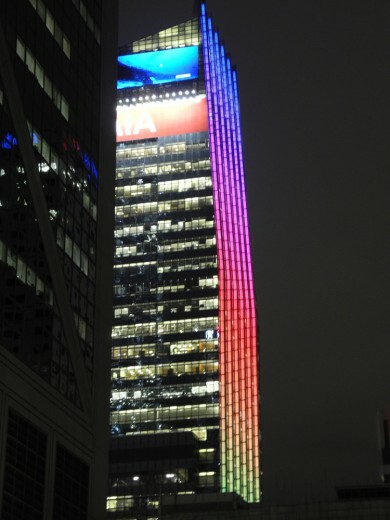 Rainbow lights in downtown Hong Kong. Double-decker streetcars -- I'm sure we can thank the Brits for these. At first, it seemed odd to see so much excitement surrounding Christmas in a predominantly Buddhist country. Upon further reflection, though, it made total sense. 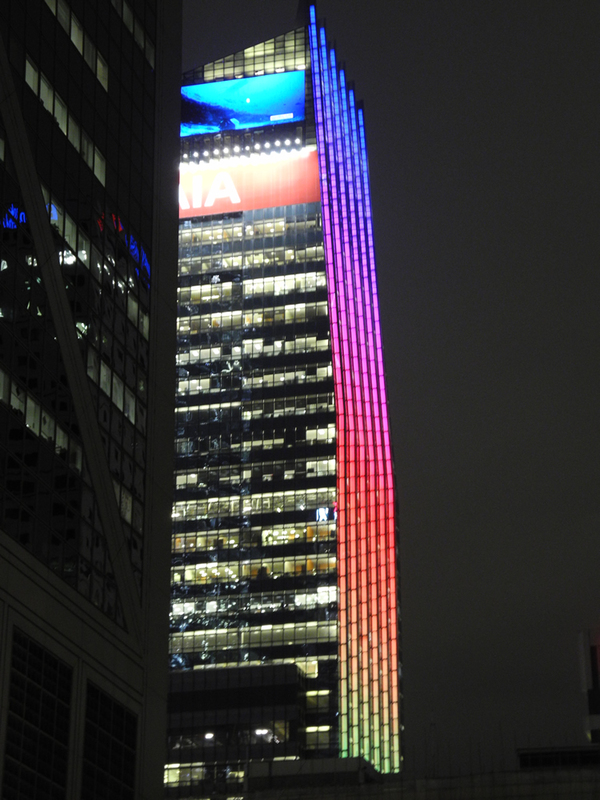 Hong Kong is not only a very multinational place (the Brits owned it until 1997), it’s also a financial power center – capitalism at its best. What’s more capitalist than Christmas these days? It is a pricey destination, but a fascinating one too, and well worth stopping by to visit for a day on one’s way home. Hey! Oakland’s Chinatown has some very good dim sum…! I know! I was just surprised that it wasn’t even better in the place where it originated.